Paige Mulhollan is remembered on campus as a dynamic but “laid-back” president who took time to personally interact with faculty, staff and students. Former Wright State University president, Paige E. Mulhollan, who established Wright State as a founding member of the Coalition of Urban and Metropolitan Universities, died Saturday in Fayetteville, Arkansas, at the age of 77. During his presidency from 1985 to 1994, the College of Science and Engineering split to form the College of Engineering and Computer Science, and the College of Science and Mathematics; the Center for Teaching and Learning opened to assist faculty development in teaching; and Wright State athletics moved to NCAA Division I. In 1990, the university hosted the first national conference of metropolitan universities and launched the journal for member institutions. Community support for Wright State under President Mulhollan’s leadership continued to expand in the early 1990s. Research funding topped $20 million in 1991–92. In 1992, the Kellogg Foundation announced a $2 million grant to fund the Partners for Community Health Development Project. This was designed to improve health care delivery and develop innovative ways to train health care professionals in medicine, nursing and psychology. His years marked an expansion of facilities and programs that enhance student and academic life: on-campus housing increased to nearly 2,000 students; the Ervin J. Nutter Center and the Fritz and Dolores Russ Engineering Center were built; and construction began on a new Student Union. When the Nutter Center was built, he was successful in making the facility much larger than the original plan for a building originally conceived as just a basketball arena. He literally doubled the size to make in the multi-use facility it is today. Dr. Mulhollan is remembered on campus as a dynamic but “laid-back” president who took time to personally interact with faculty, staff and students. He was fond of sailing. During his presidency, he could often be found taking lunchtime jogs around campus or exercising his golden retrievers, Sunshine and Autumn, on the lawn of Rockafield House, then the campus president’s residence, with his wife, Mary Bess. President Mulhollan came to Wright State with a strong background in higher education administration. He was executive vice president at Arizona State University, where he also served as chief operations officer for Arizona State West, ASU’s Phoenix branch campus. 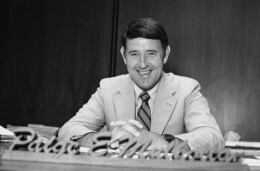 Prior to being named ASU executive vice president in 1981, he served as ASU provost and vice president for academic affairs. He earlier served as dean of arts and sciences and professor of history at the University of Oklahoma. Prior to that, he was associate dean of arts and sciences and associate professor of history at Kansas State University. From 1968 to 1969, he was a special research associate with the University of Texas Oral History Project in Washington, D.C. He also served as a faculty member at the University of Arkansas from 1963 to 1970. He was active in educational associations, the fine arts and the humanities. He served as consultant-examiner for the North Central Education Association, consultant for the Education Programs Division of the National Endowment for the Humanities, chair of the Oklahoma Humanities Committee and member of the Commission on Fine Arts. He was a founding member of the executive committee of the Division of Urban Affairs of the National Association of State Universities and Land-Grant Colleges and served on a similar committee in the American Association of State Colleges and Universities. In retirement, Paige and Mary Bess lived in Arkansas. He is survived by his wife, Mary Bess, his sons Paige Jr. and Kelly, three grandchildren and a great-grandchild.